After 15 years of experience, Nomades Kultur has aquire maturity and legitimacy to launch its Partner’s Club. Support the association Nomades Kultur is taking part in a eco-cultural and eco-citizen approach. 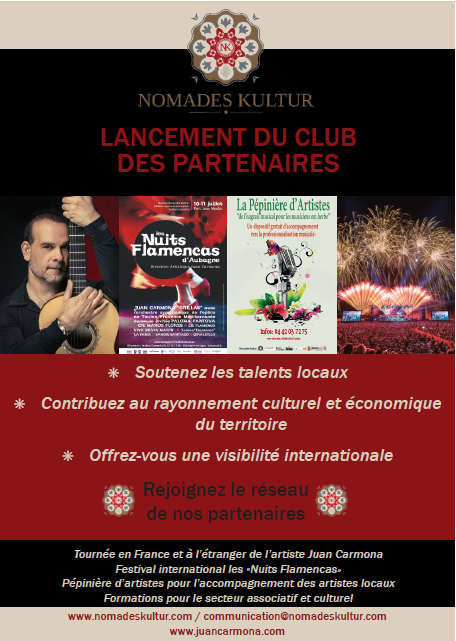 It is supporting a structure that galvanize a whole territory (Fête de la musiqued’Aubagne) and makes it glow («Nuits Flamencas» International Festival, Juan Carmona) meanwhile encouraging artistic local initiatives(Pépinièred’Artistes) . Offer yourself a national and international visibility by joining the Partner’s Club to benifit countless advantages for your clients, collaborators, suppliers, etc.